Performing their co-parental duties to their best, Hrithik and Sussanne are often seen taking their children out for exotic vacations and outings. 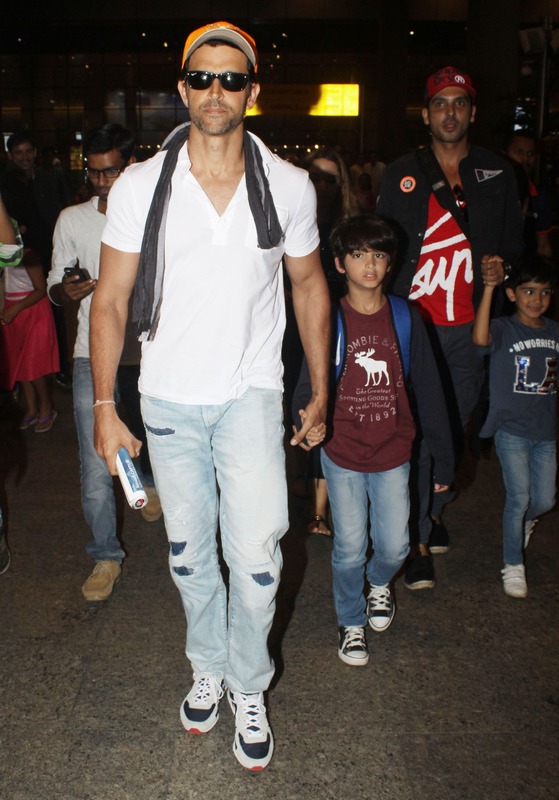 Recently, the actor was snapped along with his former wife Sussanne Khan and kids - Hrehaan and Hridhaan at the airport. Hrithik and Sussanne got officially divorced in 2014 but have definitely set goals as they are extremely cordial to each other. The ex-couple often takes joint vacation with their kids. The duo often hangout in the city and enjoy movie outings with Hrehaan and Hridaan. Hrithik was busy with the shoot of his next film, Super 30 in Varanasi. After a long shoot, he recently returned to Mumbai. The actor then took to Goa along with his former wife and children. According to reports, they were also joined in by Sonali Bendre's family. Sussanne looked pretty in a navy-blue top and a black skirt, whereas Hrithik looked dapper in a white tee-blue denim. Zayed Khan, Malaika Khan and their kids were also clicked at the airport.